What secrets does disgraced Bishop Magee take to the grave? The disgraced Bishop of Cloyne, John Magee, will bring at least two dark secrets to his grave with him. He resigned last week after a tribunal found he had blatantly failed to implement church regulations on abuse of children. The Newry-both Magee was Secretary to three Popes, Paul VI, John Paul I and John Paul II, the only cleric in history to achieve such an incredible honor. 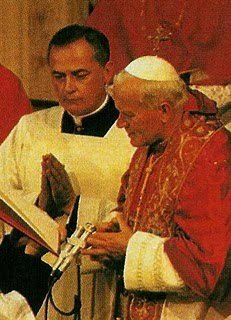 In the picture above, he is with John Paul II. John Cooney, an Irish journalist covering religious affairs, wrote how Magee proudly boasted that Pope Paul VI treated him like a son, and that John Paul II treated him like a brother. According to Cooney, he was considered the "most handsome man" in the Vatican and had incredible access to the Popes. He lived in a wonderful villa on the Vatican grounds. It even had a private chapel, and he loved to entertain friends from Ireland and arrange meetings with the Pope for a chosen few. He was widely expected to return to Ireland in triumph as Archbishop of Armagh, his home diocese, and be the future Primate of All Ireland. But John Paul 11 banished him to a lonely Cork diocese in 1987, when Magee was at the height of his power. The job of Bishop of Cloyne was intended for someone else, but John Paul insisted that Magee go. He was never liked by the priests there, who considered him a Vatican outsider who was dumped on them. The Bishop's house was a sad, drafty old building in need of repair, totally unlike his Vatican villa. The reasons why he was exiled to Cloyne have never been explained. Rumors ran rampant, including involvement in a cover-up of the death of John Paul I and unspecified personal behavior charges, but nothing ever came to light. What is known is that in 1978, on the death of John Paul I after only 33 days as Pope, Magee covered up the fact that a nun found him, and a statement was issued that he was the person who discovered the body. Why this was so has never been explained. Nor was the fact that he was briefly brought back to Rome immediately when Pope John Paul II died for unspecified duties. By all accounts, he went into a deep funk when posted to Cloyne, a minor diocese in Ireland far from his beloved Armagh. His lack of oversight of the child abuse problems in his parish were seen as a sign of his total disinterest in his new duties. Now he is gone, and the mystery of how he ever ended up in Cloyne, or why he tried to mask the truth of who found the body of John Paul I, may never be known. In "Angels and Demons," Dan Brown's prequel to "The Da Vinci Code," an ambitious Irish priest close to the Pope almost becomes Pope himself by plotting and eliminating enemies during a papal conclave. The book's Rev. Patrick McKenna may well have been loosely based on Magee. Whatever lofty ambitions Magee had, they have long since ended, and he resigned in disgrace. It was surely not the script he had written for himself.